The country of Jordan has a lot of religious and cultural significance because of popular sites like the burial site of Moses and houses a very large population of both Muslims and Christians.As a part of the Fertile Crescent in ancient times, Jordan has a lot of historical sites to explore. Located in western Asia, Jordan shares borders with 5 countries which include Saudi Arabia, Syria, Iraq, Israel and Palestine. Situated in the Western Arab, Jordan is located on the East Bank of the Jordan River. It has been settled since the time of the Paleolithic age. It mostly gained fame during the time of the Ottoman Empire. But it was only in 1922 that it was recognized as part of the League of Nations when it came under the rule of the British protectorate. It came back under the rule of the Arabs and was named as Hashemite Kingdom of Jordan in 1948. Considered to be one of the safest of Arab states for people of all nationalities, Jordan is a host to millions of refugees from Iraq, Syria and Palestine. Since it is also a high human development country, it is one an attractive tourist spot for people from all over the world, since there are lots of things to do in Jordan. The great thing about Jordan is the preservation of all the historic sites and archeological feats of the olden days. Petra is one of the most interesting sites to visit and things to do in Jordan. Named as a UNESCO World Heritage Site, Petra is a whole city which is known for its rock-cut architecture and its water conduit system. Since the place is carved out of red stones, it is also known as Rose City. It is believed that the city was established as early as 312 BC and was the capital of the Arab Nabataeans. Some other things to do in Jordan include visiting the Qasr Amra, the ruins of the desert castles that were built in the 8th century; Mount Nebo, the place from where Moses was able to see the Promised Land according to the Bible; Ajloun Castle, built in the 12th century in order to protect the ‘wadis’; and the Montreal Crusader Castle which was constructed in 1115 by Baldwin I of Jerusalem. There are also many other things to do in Jordan depending on what the tourist is interested in. 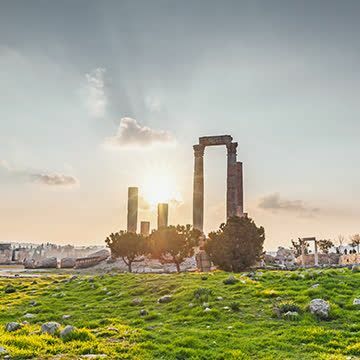 For the history buff, the Jordan Archaeological Museum, King Abdullah I Mosque, Roman Theater, Madaba Map, Amman Citadel, Temple of Artemis, Jerash, Mound Pisgah are also fascinating things to do in Jordan. All these places offer rich source of history and culture that allows the visitor to get to know about the beautifully intricate history of the state and how it became the country that it is today. What’s more, there are also many natives who would be happy to guide tourists to the right spots and allow them in their home to give them clear information about the olden days. Many guided tours and daytime visits are organized in the city that tourists can become a part of if they wish. The great thing about Jordan is that because of its diverse history, the place never becomes boring; something new can be discovered during every single visit. Since Jordan is a developed country, there are also many luxurious hotels, spas and clubs that you can visit. Likewise, some other interesting things to do in Jordan can be centered on modern versions of entertainment like parks, natural resorts, water sports, theater, cinema and much, much more. People who are looking for things to do in Jordan can pay a visit to the Azraq Wetland Reserve. It is a nature reserve in Amman, which is an oasis for migratory birds. Even though the natural springs had dried up by the year 1922, artificial ponds and springs are maintained by the local government so that it can be maintained as a public resort and tourist spot. There are quite a few things to do in Jordan Azraq Wetland Reserve. There is a marsh trail, which contains a rustic bird hide as well as a reception lounge. The place is ideal for picnics with loved ones. Whoever is into art and architecture can visit the Mango house as an interesting thing to do in Jordan. The place is considered to be the best example of modern Jordanian architecture. With wrap around balconies and smooth rose stone, the place is majestic yet cozy at the same time. All those who have a thing for automobiles can visit the Royal Automobile Museum, which contains a huge collection of luxury cars. If you want to visit the Dead Sea, then you can do so by taking one of the all day trips. Not only will you be able to swim in the water, but also check out the vast seashore. There is also a resort where you can indulge in spas, sun beds and much more. There is also a wellness treatment that can be enjoyed. It is one of the best things to do in Jordan, that people from all over the world come to enjoy. It is considered to be the best and most looked forward to activity. Some other fun things to do in Jordan are visiting the Al-Beidha, High Palace of Sacrifice, the Royal Tombs, Madaba Mosaic Map, Wadi Araba Desert for camping, Street of Facades for a look at amazing architecture, Berenice Beach Club for a chill day at the seashore, Wadi al-Mujib for some awesome canoeing experience, Jordan River Baptismal Site for a serene experience, Burdah Bridge Wadi Rum for exceptional photography and much more. If your things to do in Jordan include shopping at the local bazaar then Al Balad is the place for you. Jordan is known for is delectable cuisine. The local foods, as well as the international foods offered there are considered to be some of the best in the Arab countries. For all foodies, Jordan is a haven to delight their palates and satisfy their stomach. Some of the must visit restaurants include, Suzette’s, Clancy’s Bar & Restaurant, Fakhr El-Din, Sfra Restaurant, Brisket, Beit Sitti, Abu Jbara, Kan Zamaan, Reem albawadi, Vinaigrette, Burj Al Hamam, Bookscafe, Centro Brasserie, Levant Restaurant and more.